This is my post to list my books that I have read for the Library Challenge. 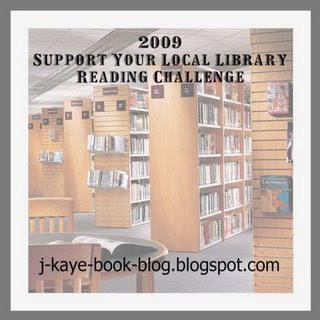 I am aiming to read at least 50 books from the library as part of this challenge. You're brave, picking 50 books. That would be half my books for the year, I think. I was a wimp and only picked 12, but I think I'll manage that pretty easily, so I'm going to see if I make 25 instead. Most of the books I read are from the library. Where I struggle is to read book that I own. Last year I think I read more than 150 books from the library. Wow. I don't manage to read 150 books in a year (the best I can do is about 125), let alone 150 from the library! But with the current economic climate, my library is going to get a lot more visits from me, I'm sure. We usually try to go about once a week with the almost 5 year old, so picking up books is easy. Links to post your reviews are up in the right sidebar at J. Kaye’s Book Blog.